Traditional braces are effective, but there are several dietary restrictions. Not with Invisalign. Since the aligners are removable, you can still eat and drink anything; however, you should not have anything except water while wearing them. Although drinking is possible while wearing them, it is best to only have water. Darkly pigmented drinks, like coffee, tea, or red wine can cause them to discolor. After eating or drinking, you do not want to place the aligners back into your mouth without cleaning them first. This can cause food particles and bacteria to become trapped between the aligners and your teeth. Not only can this lead to discoloration and odors, but it can also increase your risk for tooth decay and gum disease. It is best to brush your teeth well before placing your aligners back into your mouth. If that is not possible, rinse your mouth with water until you are able to use your toothbrush. Properly caring for your aligners is vital for protecting their translucent appearance and to keep your smile healthy during your treatment. In addition to brushing twice a day and flossing every night, take the time to clean your aligners. Use a soft-bristled toothbrush and clear antibacterial soap to clean them. Do not use toothpastes because they are abrasive. This can lead to scratches on their surfaces, which can cause discoloration. Do not use any colored soaps because the dye can stain them. When handling your aligners, do so with care to avoid causing damage to them. If one should crack or break, contact your dentist in Westmont right away to avoid causing a setback in your treatment plan. If you are ready to make a true investment in your oral health and your confidence, it is time to join more than 1.5 million people who have chosen Invisalign. You will get the smile of your dreams while getting the results you want in about 12 months. See if the clear aligners are the right choice for you today. Dr. Jason Hong and Dr. Kathy Lam provide complete dental care in a comfortable environment to create healthy, beautiful smiles. In addition to general dentistry, they provide cosmetic services, including Invisalign. 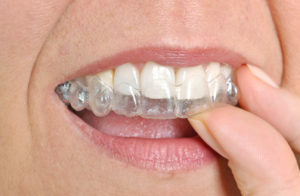 With the clear aligners, you will align your teeth and bite to improve your oral health and your self-esteem. Contact our office today to schedule your consultation for a straight smile.